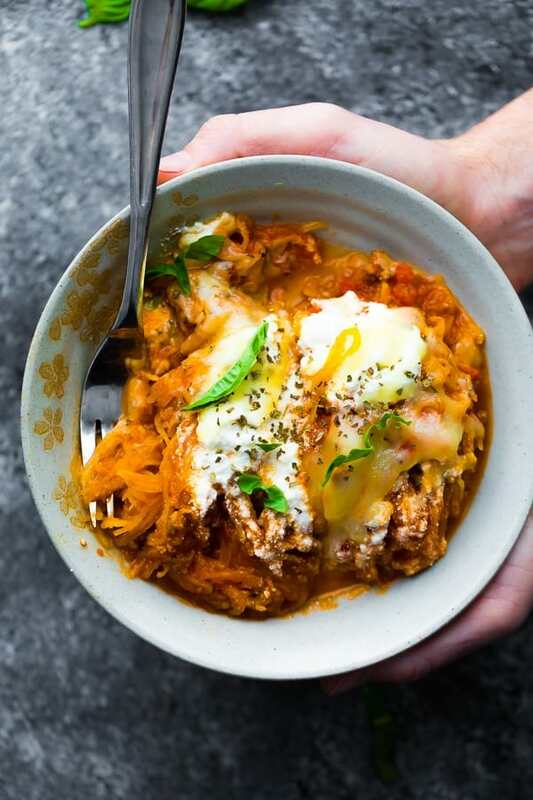 This low carb lasagna skillet replaces noodles with spaghetti squash. So simple to throw together on a weeknight, and easy prep ahead and reheat for easy lunches! Lasagna might just be one of my all-time favorite meals! The cheese, the sauce, the noodles, the CHEESE. I am so happy to find some lighter lasagna recipes (like this Zucchini Noodle Lasagna, and these Lasagna Stuffed Portobellos) that help us fit it into our healthy lifestyle. 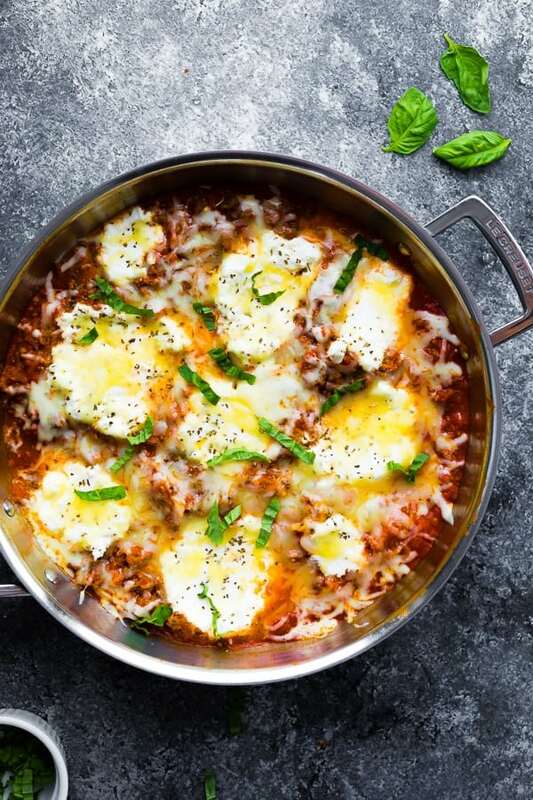 And today we’re using spaghetti squash as a noodle replacement in this low carb lasagna skillet! 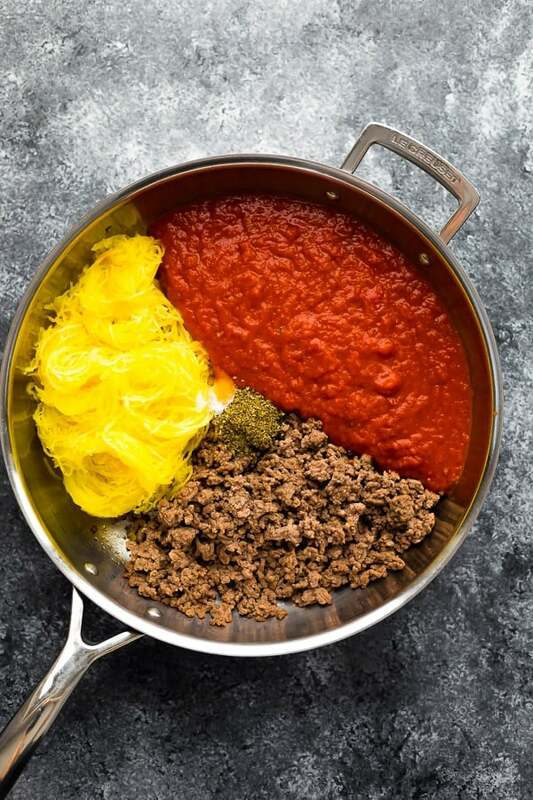 Not only is it easier to put together than a traditional lasagna recipe, but it is lighter with only 9 grams net carbs per serving. 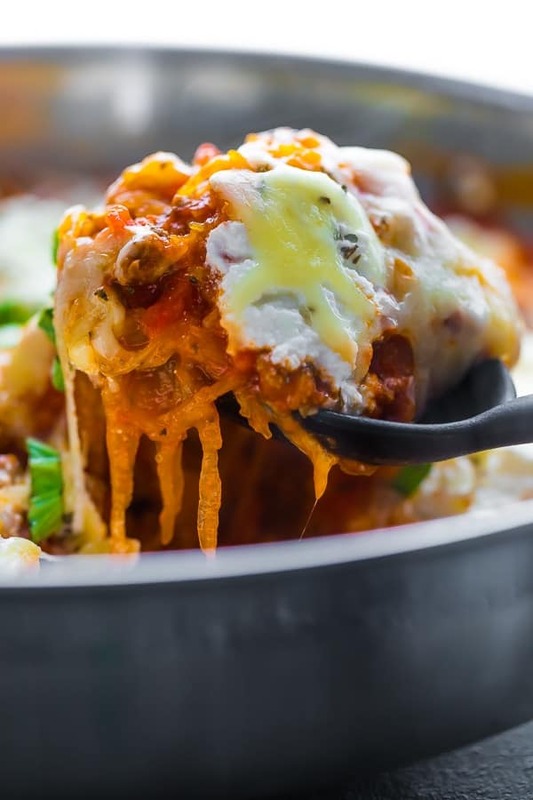 This low carb skillet lasagna recipe replaces the noodles with spaghetti squash. I recommend cooking your spaghetti squash in the Instant Pot for the quickest method, but you can also bake it in the oven. In a large oven-proof skillet, cook your lean ground beef. Drain the fat/liquid. Add in marinara sauce (look for a low carb brand like Rao’s if you are keto), spaghetti squash, and spices. Cook for a few min. Dollop with ricotta. Sprinkle with mozzarella. Place in the oven and bake for 5 min until cheese melts. 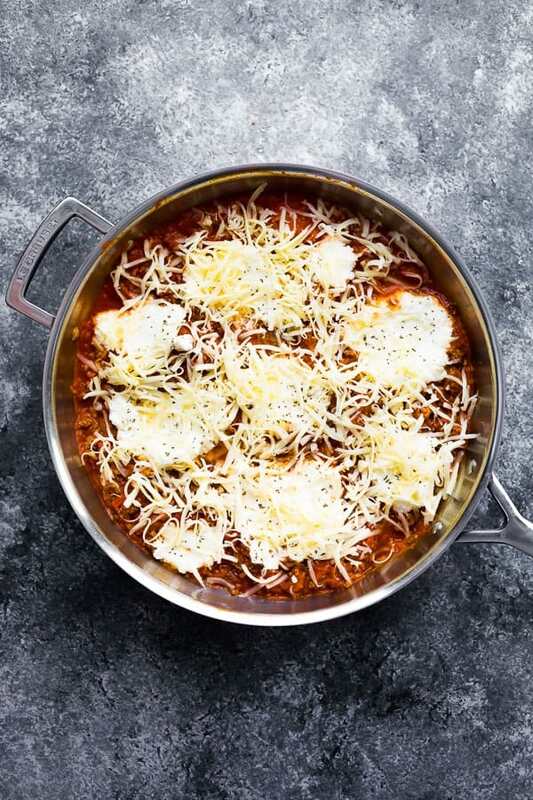 Can I make this low carb lasagna skillet with regular noodles? Probably, although I have not tried. I would pre-cook them, drain, and then stir them in. Can I swap the spaghetti squash for another veggie noodle? YES! I would swap for an equal volume of spiralized zucchini, or butternut squash. You don’t need to pre-cook the zucchini noodles as they cook quickly in the sauce, but I would pre-cook the butternut squash noodles by sautéing or lightly steaming before stirring in. 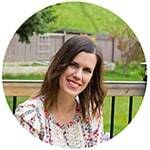 Can I freeze this low carb lasagna? It *may* freeze if you only cook your spaghetti squash to al dente. If I were to freeze this recipe, I would stir together the ingredients, and skip the oven step. How long does this spaghetti squash lasagna last for? This recipe does get a little bit ‘liquidy’ as it sits in the fridge. To minimize liquid, strain your ricotta and make sure to strain off any extra liquid from your spaghetti squash. If prepared this way, this spaghetti squash lasagna keeps well and workes great as a meal prep lunch. Refrigerate for up to 4 days, and heat in the microwave until steaming hot. 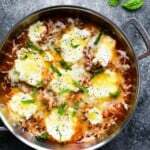 What to serve with spaghetti squash lasagna? ; make sure you use a large, oven-safe one! Cook beef in a deep 12-inch oven-safe skillet, breaking it up with a spatula. Cook until no pink remains, roughly 8 minutes. Use a paper towel to blot up extra grease or fat from the pan. Add the cooked spaghetti squash, marinara sauce, basil, oregano and salt. Stir to combine (tongs make it easier to mix the spaghetti squash in with the sauce/beef). Cook for 3 or so minutes, until heated through. Dollop the ricotta over the skillet, then sprinkle with cheese. Place the skillet in the heated oven for 5 or so minutes, until sauce bubbles and cheese is melted. Using oven mitts, carefully remove the skillet from the oven. Store in sealed containers in the fridge for up to 4 days. Heat until steaming hot in the microwave and enjoy. I can’t even begin to tell you how much I love this recipe!!! I’ve been wanting to try veggie noodles FOREVER, but I was afraid it would taste awful. I’m also a picky eater, so my “as seen on TV” spiralizer sat in a drawer for so long, I’m surpised it didn’t rust! Well, fast forward to this recipe and I decided to give it a real try. I mean, who doesn’t love lasagna??? Especially if it’s as easy as this???! I didn’t use spaghetti squash (it’s a work in progress lol), so I subbed zucchini, and I didn’t even miss the pasta! I’m working on eating healthier and this is a favorite recipe. Thank you for making me a zoodle lover for life! ? Yay! I’m so happy to hear this, Danielle! I can’t wait to try with zucchini noodles!